A 1964 Proof Kennedy half dollar Accented Hair variety. The Kennedy half dollar series provides some well known and some obscure mint errors and varieties. Although this series features one of the most popular presidents in United States history, demand for these coins are fairly high, but they are abundantly available at most coin dealers and on the Internet. Most collectors remember the day in November of 1963 when President Kennedy was assassinated. The United States Mint released the first coins in 1964 and people scrambled to get a souvenir to remember this popular president. The mint produced over 273 million coins at the Philadelphia mint and more than 156 million coins at the Denver mint facility. The best-known variety is the 1964 Proof Heavily Accented Hair variety. Given the low demand for Kennedy half dollar errors and varieties, most are extremely affordable for collectors of all means. A careful search of the Internet or inquire at your local coin dealer will yield several examples for you to evaluate. No coin series would be complete without its fair share of mint errors and die varieties. Beginning collectors will want to look for examples as they search their rolls for the following errors and varieties because they carry a premium over the normal common specimens. The hair above Kennedy's hair has a few more incused lines making his hair look more pronounced. Additionally, look at the "I" in LIBERTY. The lower left serif seems to be truncated or missing. Look carefully at the words WE TRUST on the obverse of the coin. You will see a slight doubling near the tops of the letter. It is also sometimes evident on the RTY of the word LIBERTY. Some 1964-D coins minted in Denver can also be doubled dies. In 1968 mint marks were punched by hand into the coin dies. The workmen at the mint facility punched the "S" upside down. Normally the upper hook of the S is smaller than the lower hook. In this variety, the upper hook is larger than the lower. A few of the 40% silver clad planchets used from 1965 to 1970 slipped into regular production lines at the Denver mint in 1971. Silver clad planchets were also used in 1976 to produce the circulating commemorative American Bicentennial half dollars. 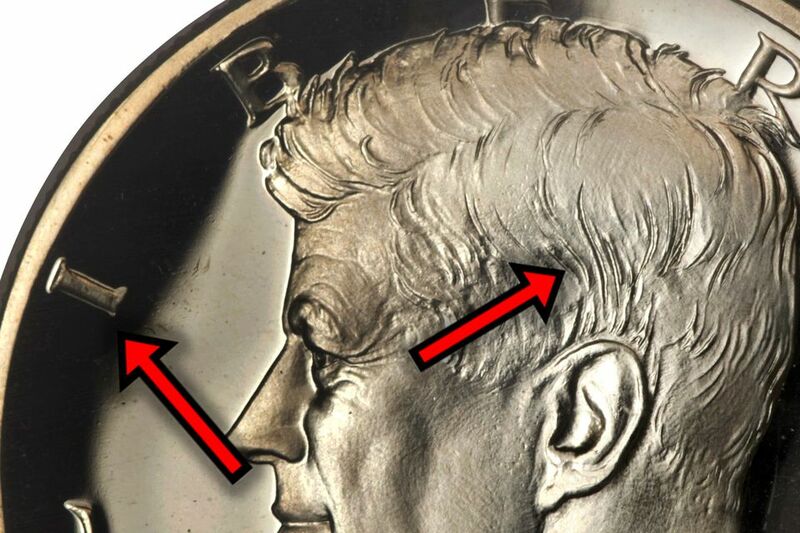 Once again, some of these silver clad planchets were used to make Kennedy half dollars dated 1977. A production error occurred on the obverse coin die in 1974. The letters on the coin appear to be doubled. The doubling is especially evident on the letters in TRUST on the obverse. In the middle of 1979, the mint replaced the obverse hubs for the Kennedy half dollars. Due to years of use, the punch used to put the mint mark on the hub became worn and made the mint mark look more like a blob than an "S." The new hub had a mint mark that was much clearer. Once again in 1981, the hub was redone, and the mint mark was less pronounced and flatter. Additionally, the ends of the hook on the "S" have a bulbous end that is very pronounced. This coin was part of a special commemorative set that featured a commemorative silver dollar of Robert F. Kennedy. The second coin in the set was a specially struck Kennedy half dollar that had a matte finish and was made out of 90% silver. Unlike the Proof version, this coin does not have mirrored fields and frosted devices. The entire coin has an overall satin finish to it. The United States Mint celebrated the fiftieth anniversary of the minting of the first Kennedy half-dollar. In addition to four other specially minted Kennedy half dollars, the mint also produced a 99.99% pure gold half a troy ounce Kennedy half-dollar in the Proof finish. Only 73,772 coins were minted in this limited production run.